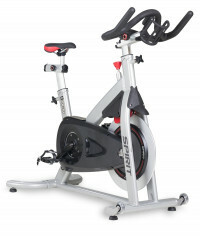 The CIC800 Indoor Cycle excels in three critical areas – durability, comfort and performance. It is a perfect addition to a club, corporate fitness/recreation center, school or hotel because the stout design will withstand hours of consistent use. The needle bearings that encompass the pedals and flywheel axle, industrial grade Hutchinson Poly-V belt, and our three piece crank work synergistically to create the perfect formula for durability and performance. The fore/aft/up/down adjustments of the handlebars and seat along with SPD dual pedal design provide a comfortable fit for nearly any size rider.